She was redeployed west of Gibraltor on the 2nd of August 2015.. 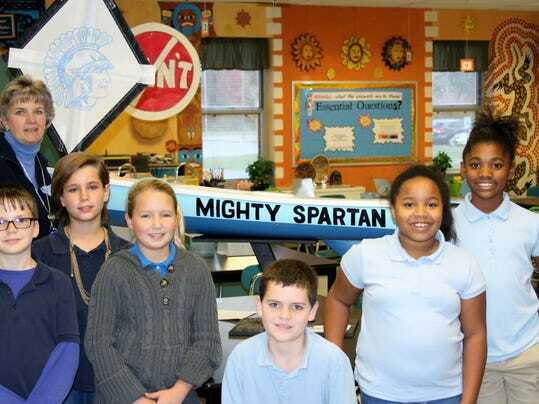 This boat from Pam Hobb’s 5-6 grade class at Lake Forest Central Elementary School in Felton, Delaware was launched off a freighter headed to Bermuda on 19 November 2014. It made an incredibly fast passage to Strandhill Ireland where it made a soft landing on 31 March 2015. You can see its path at http://www.nefsc.noaa.gov/drifter/drift_ep_2014_3.html. It was found in Ireland by two friends and a dog “Daisy” (see photo below) walking along the beach. One friend, an environmental scientist, was visiting from Poland and the other, Sean Creaven, a local from Silgo. Sean’s 10 year old son eventually brought the boat into his classroom! You can read about this in both local and national news. The same day this reached the press, teacher Pam Hobbs received a personal phone call from Governor Markell! A movie sent to us from Ireland shows the landscape and environment around “Sligo”. It can be viewed here. The blog setup by the school in Ireland can be viewed here. The Irish RTE radio podcast in late June 2015 can be listened to here. The plan is to put the Mighty Spartan aboard the Sea Education’s Cornwith-Cramer when it docks in Cork in early July 2015 and have them deploy hundreds of miles offshore. Prior to getting underway, the boat will be show cased at the “Oceans Wealth Conference” in Cork. After hearing the story on the radio both the Irish Sailing Association and Irelands Marine Institute who will be at the conference, are both very interested as reported in another radio podcast here. So how long do you think it would take a small wooden boat to sail across the Atlantic Ocean? So how long do you think it would take a small wooden boat, about 1.5m in length to cross the wild Atlantic Ocean? The fact that such a craft could survive such a journey at all would be amazing in itself but to travel over 4000 km in just 4 months would be truly phenomenal! But this is exactly what did happen! 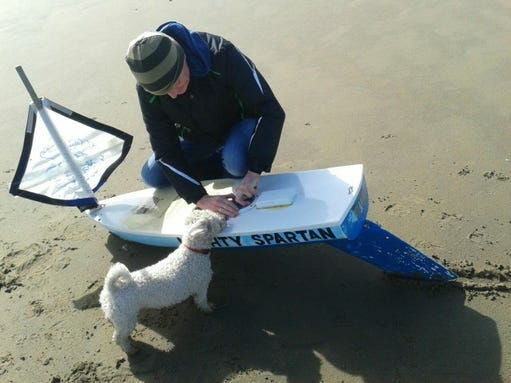 Over the Easter holidays, while out for a walk, Mr. Seán Creaven, Conor’s Dad, found a little boat on Strandhill beach. The boat named “Mighty Spartan” also displayed both the American and Delaware flags. Inside the boat he found a t-shirt, a Delaware flag, a computer flash drive and a letter. The letter informed him that the boat had been set afloat by 4th and 5th graders in Lake Forest Central Elementary School in Fenton, Delaware, U.S.A. It had been launched from a freighter ship off the island of Bermuda last November. The boat also contained a GPS tracking device. We were very excited on our return after Easter when Mr.Creaven told us that Lake Forest School, Delaware would like to forge links with Carbury N.S. He invited us to view the video contained on the flash drive, which outlines a day in the life of Lake Forest Central School. Initial contact has been made and both schools are keen to collaborate together to provide learning opportunities for our pupils on both sides of the Atlantic. It is envisaged that we will arrange a relaunch of “Mighty Spartan” and together both schools will track and anticipate the possible route it will take. Plans are also afoot to have our first “face to face” meeting with our new American friends via Skype. We also have a few other ideas in mind so watch this space!! Click here to see our photographs. A Delaware News Journal covered the story on April 3, 2015, Delaware kids’ mini-boat lands in Ireland.